Next, we’ll use the “Audits” panel (Lighthouse) from Chrome DevTools to analyze our web application against the core tenets of PWAs. Finally, we’ll explain and add the PWA features to our web application according to the “Progressive Web App” section in the Lighthouse report. Before we start implementing our PWA, let’s first introduce PWAs and Lighthouse. A Progressive Web App or PWA is a web application that has a set of capabilities (similar to native apps) which provide an app-like experience to users. PWAs need to meet a set of essential requirements that we’ll see next. PWAs are similar to native apps but are deployed and accessible from web servers via URLs, so we don’t need to go through app stores. Work for every user, regardless of browser choice, because they are built with progressive enhancement as a core tenet. Fit any form factor, desktop, mobile, tablet, or whatever is next. Use the app-shell model to provide app-style navigation and interactions. Served via HTTPS to prevent snooping and ensure content has not been tampered with. Are identifiable as “applications” thanks to W3C manifests and service worker registration scope allowing search engines to find them. Make re-engagement easy through features like push notifications. Allow users to “keep” apps they find most useful on their home screen without the hassle of an app store. Easily share via URL and not require complex installation. Getting workflow just right ain’t an easy task. So are proper estimates. Or alignment among different departments. That’s why we’ve set up “this-is-how-I-work”-sessions — with smart cookies sharing what works well for them. 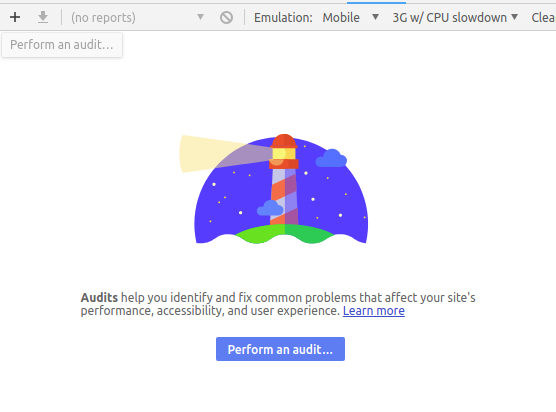 Lighthouse is an open-source auditing tool created by Google which can be used to audit websites and applications for accessibility performance, SEO, best practices and PWA features. You can access Lighthouse from the Audit tab in Chrome DevTools as a module in Node.js or as a CLI tool. You can use Lighthouse by providing an URL and then running the audits which will provide you with a report containing the auditing results which are basically suggestions on how you can improve your web application. In this section, we’ll install the latest version of Angular CLI then we’ll use it to create a new Angular 6 project. In case you don’t have Node.js installed, you can simply head on to the official Node download page and grab the Node binaries for your system. Note: Depending on your npm configuration, you may need to add _sudo_ to install packages globally. Most work that’s done will be inside the src/ folder that contains the source code of the application. After generating a project, we’ll build a web application that consumes a JSON API and displays the items on the home page. We’ll use the HttpClient service for sending HTTP requests and Angular Material for building the UI. 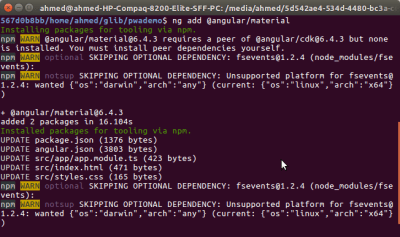 You can see from the screenshot that the command installs the required package from npm and update a bunch of files for setting up Angular Material in your project which previously needed manual updates. That’s it. We can now inject and use HttpClient in any component or service that belongs to the main module. This will create a service called ApiService in the src/app/api.service.ts file. We first imported the HttpClient and Observable classes then injected the HttpClient in the constructor as httpClient and added a fetch() method which calls the get() method of HttpClient (for sending an HTTP GET request to our JSON endpoint) and returns an Observable that we can subscribe to later. We also declared an Item interface which represents a single item of the returned JSON data. We import the ApiService that we created before and we inject it as apiService, we also import the Item class which represents a single item of our JSON data and we declare the items variable of type Array<Item> which will hold the fetched items. Next, we add a fetchData() method which calls our fetch() method that we defined in the ApiService which returns an Observable. We simply subscribe to this observable in order to send a GET request to our JSON endpoint and get the response data that we finally assign to the items array. We call the fetchData() method in the ngOnInit() life-cycle event so it will be called once the AppComponent component is initialized. Our application UI will consist of a navigation bar and the skeleton of the page which will be created with Angular Material. Before using an Angular Material component, you’ll need to import its module. Each Material component belongs to its own module. We import modules for toolbar, card and button components and we add them to the imports array of the AppModule. We use Material components to create the UI. The <mat-toolbar> component is used to create a Material toolbar and the <mat-card> component is used to create a Material card etc. We iterate over the items array which gets populated by the fetchData() method when the component is initialized, and display items as Material cards. Each card contains the name, description and a link for more information (The link is styled as a Material button using the mat-raised-button directive). Typically, when checking your application for PWA features you should first build it for production because most PWA features are not added in development. For example, you don’t want to have service workers and caching enabled in development since you will periodically need to update the files. The production build will be available from the dist/pwademo folder. We can use a tool like http-server to serve it. The -o option will automatically open the default browser in your system and navigate to the http://127.0.0.1:8080/ address where our web application is available. Let’s now analyze our application using Lighthouse. First, launch Chrome and visit our application address http://127.0.0.1:8080/. Next, open Developer Tools or press Ctrl + Shift + I and click on the Audit panel. You preferably need to set the Emulation to Mobile instead of Desktop to emulate a mobile environment. Next, click on Perform an audit… blue button. You’ll have a dialog opened in which you need to choose the types of the audits you want to perform against your web application. 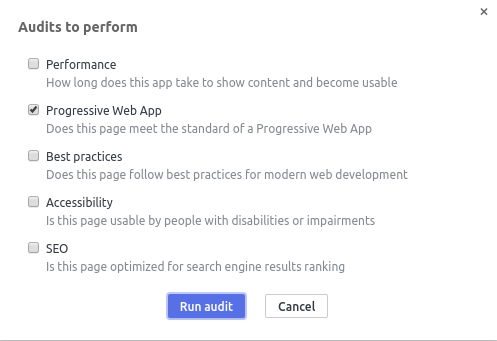 Un-check all types but Progressive Web App and click the Run audit button. 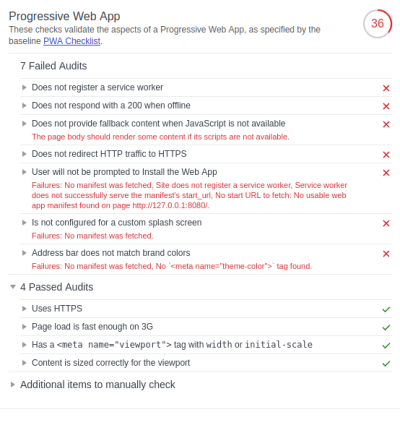 Lighthouse performs a series of checks which validate the aspects of a Progressive Web App specified by the PWA Checklist. We get an initial score of 36⁄100 that’s because we have some audits passed. 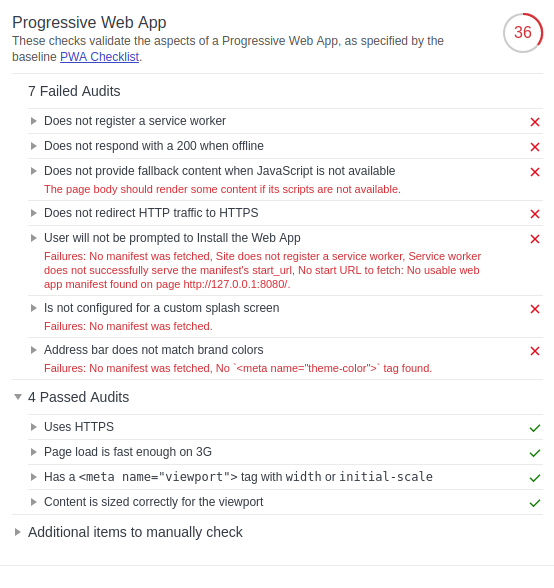 Our application has 7 failed audits mainly related to Service Workers, Progressive Enhancement, HTTPS and Web App Manifest which are the core aspects of a PWA. The first two failed audits (“Does not register a service worker” and “Does not respond with a 200 when offline”) are related to Service Workers and caching. So what’s a service worker? A service worker is a feature that’s available on modern browsers which can be used as a network proxy that lets your application intercept network requests to cache assets and data. This could be used for implementing PWA features such as offline support and Push notifications etc. To pass these audits we simply need to register a service worker and use it to cache files locally. 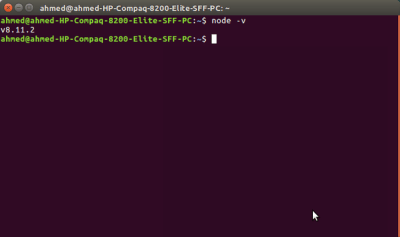 When offline, the SW should return the locally cached version of the file. We’ll see a bit later how to add that with one CLI command. 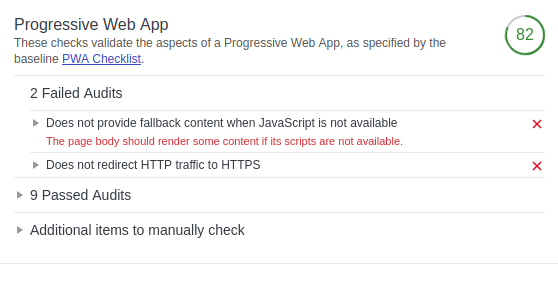 The fourth failed audit (“Does not redirect HTTP traffic to HTTPS”) is related to HTTPS which is also a core aspect of PWAs (service workers can be only served from secure origins, except for localhost). The “Uses HTTPS” audit itself is considered as passed by Lighthouse since we’re auditing localhost but once you use an actual host you need a SSL certificate. You can get a free SSL certificate from different services such as Let’s Encrypt, Cloudflare, Firebase or Netlify etc. The three failed audits (“User will not be prompted to Install the Web App”, “Is not configured for a custom Splash Screen” and “Address bar does not match brand colors”) are related to a missing Web App Manifest which is a file in JSON format that provides the name, description, icons and other information required by a PWA. It lets users install the web app on the home screen just like native apps without going through an app store. You need to provide a web app manifest and reference it from the index.html file using a <link> tag with rel property set to manifest. We’ll see next how we can do that automatically with one CLI command. 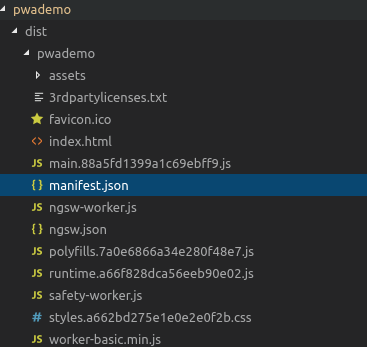 As you can see, the added manifest.json file has all the information required by a PWA such as the name, description and start_url etc. The manifest.json file, links to icons with different sizes, that were also added automatically in the assets/icons folder. 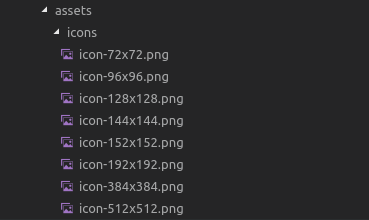 You will, of course, need to change those icons with your own once you are ready to build the final version of your PWA. The service worker build support is also enabled in the CLI. 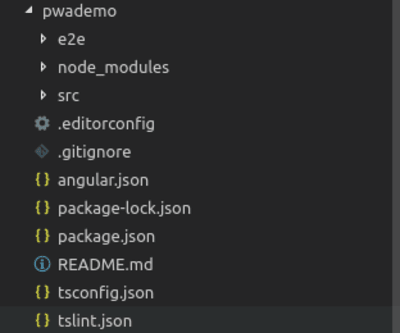 In the angular.json file a "serviceWorker": true configuration option is added. The theme color tells the browser what color to tint UI elements such as the address bar. Adding the theme color to both the index.html and manifest.json files fixes the Address Bar Matches Brand Colors audit. Another file src/ngsw-config.json is added to the project but It’s not a required file for PWAs. It’s a configuration file which allows you to specify which files and data URLs the Angular service worker should cache and how it should update the cached files and data. You can find all details about this file from the official docs. 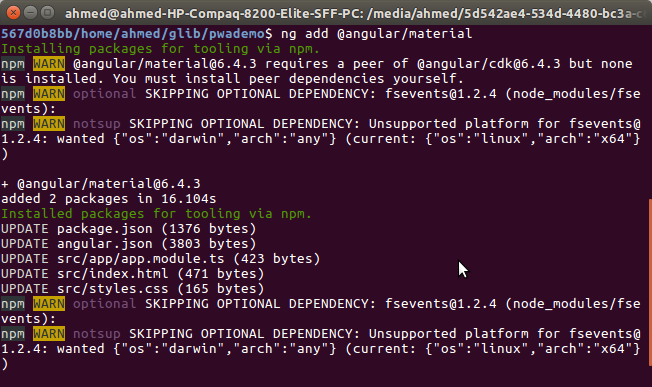 Note: As of this writing, with the latest 6.1.3 previous ng add @angular/pwa command will fail with this error: Path “/ngsw-config.json” already exists so for now the solution is to downgrade @angular/cli and @angular/pwa to version 6.0.8. We have only one failed audit which is related to HTTPS redirect. We need to host the application and configure HTTP to HTTPS redirect. Let’s now run the audits against a hosted and secured version of our PWA. We get a score of 100⁄100 which means we’ve successfully implemented all core tenets of PWAs. You can get the final code of this demo PWA from this GitHub repository. 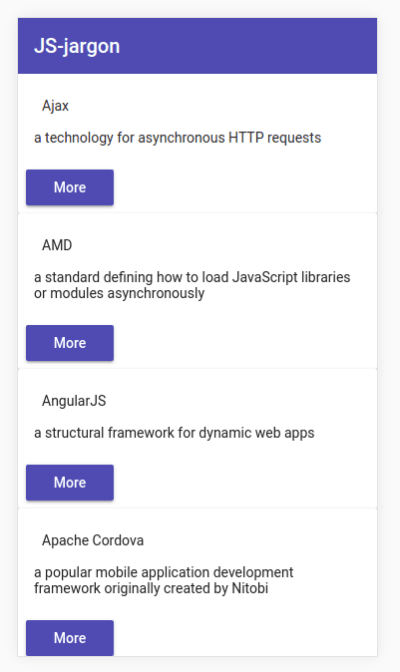 In this tutorial, we’ve built a simple Angular application and have turned it into a PWA using Angular CLI. We used Google’s Lighthouse to audit our application for PWA features and explained various core tenets of PWAs such as Service Workers for adding offline support and push notifications. The Web Manifest file for enabling add-to-home-screen and splash screen features, Progressive Enhancement as well as HTTPS . You may also need to manually check for other items highlighted (under the “Additional items to manually check” section) but not automatically checked by Lighthouse. These checks are required by the baseline PWA Checklist by Google. They do not affect the PWA score but it’s important that you verify them manually. For example, you need to make sure your site works cross-browser and that each page has a URL which is important for the purpose of shareability on social media. Since PWAs are also about other aspects such as better perceived performance and accessibility, you can also use Lighthouse for auditing your PWA (or any general website) for these aspects and improve it as needed.